Well, we are back in action in our new and much larger location! Everything went very smooth, but also took much longer than I ever anticipated! We’ve been posting some photos on our Instagram, Twitter, and Facebook page. We’ll continue to do so as we continue settling. For those of you expecting an email from me, you should have received it by now. If not, please reach out. Our new information is now on our Contact Page. Thanks for your patience as we made this transition that is proving to be quite excellent for our business! As many of you know, we are going to be moving our business to a much larger space (almost 4-fold larger! We are so excited!). This move will begin this afternoon, and will continue through all of next week. So if everything goes as planned, we will be back in action on Feb 6th. For those of you wondering how this will effect our order queue, fear not! We knew this move was coming, so back in December we purposely worked in an extra week of orders to get ahead. This means that all orders that occurred before the move were shipped a week early, and all orders after the move will still be delivered on the promised date. If this does not occur for some unforeseen reason, I’ll reach out individually to the customers effected. So the main reason for this post – we will most likely be completely incommunicado until we are up an running again on Feb 6th. During this move, I can’t promise that I can return emails in any kind of timely manner (if at all), and we won’t be answering the phones so we can focus entirely on the move. This is not going to be a small undertaking…our machines are very large and very heavy. Getting them safely moved, wired, and re-calibrated at the new location has me a little stressed out! And this is only the large machines! We have plenty of smaller machines, inventory, materials….basically everything to safely relocate! I think that we’ll be fine, but wish us luck! I’ll give updates when we are safely settled in. We are currently taking our Holiday Break. I will be taking a much needed break from my computer, so I probably won’t be able to return emails until the New Year. During this time, Andrea and I as well as our employees will be focusing on our families and not work. So if I don’t respond to emails until after the New Year, you’ll know why. And stay tuned – we’ll have some pretty great announcements in early 2017! I’d like to say thanks to everyone for another great year! We at Edison truly appreciate your business! It’s that time of year for us to give thanks! Here at Edison we have a lot to be thankful for! Our business has been growing and growing since the beginning. In the last six years we’ve been recognized with five consecutive wins in the Goldspot Polls, and have been recognized by Pen World Magazine in their Readers’ Choice Awards twice (nomination and win), along with plenty of good press in general. When I sit down with family today for my favorite meal of the year, a big portion of my thanks definitely goes to our fans, who we wouldn’t exist without. Thanks for supporting our business! My wife and I just celebrated our 13th anniversary yesterday. Our 11 year old is doing great in school and is growing up too fast! Our employees love what they do! Everyone is healthy and happy! So again, thanks for supporting our business, and everyone have a great Thanksgiving! Please take a moment this week to recall all of the blessings in your life! 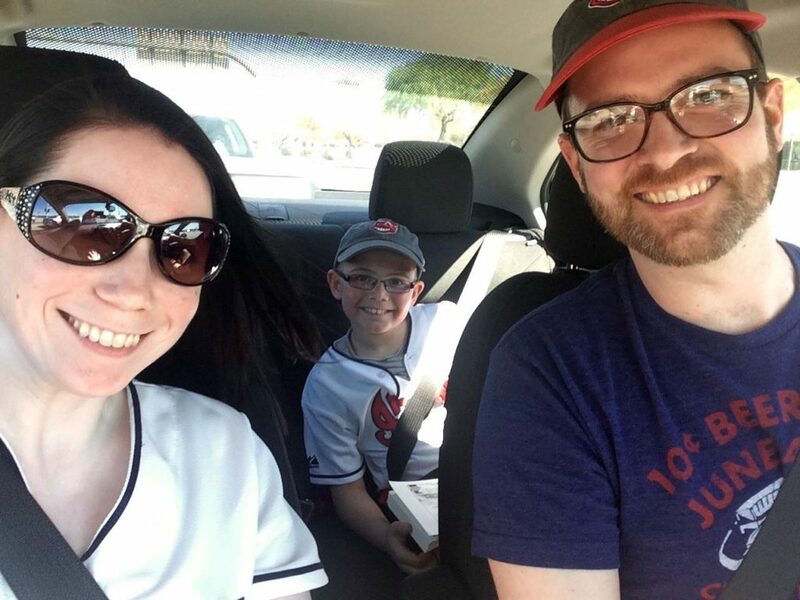 Below is a photo from the summer of my family heading to our favorite place – the ballpark! We’ll be heading to the Ohio Pen Show today! For those who have never attended this show, I recommend it. This show is always a nice combination of Vintage and Modern Pens. We’ll be set up Friday, Saturday, and Sunday! We hope to see you there! Friday, November 4th is Fountain Pen Day! We will be offering a free italic grind (stub italic, cursive italic, or crisp italic), valued at $40 with the purchase of any Current Inventory Pen. Click here for the gallery showing these pens, or there is also a slideshow at the bottom of this post showing these pens.